As the weather in Raleigh cools and the leaves start to change color, the atmosphere is ripe for a harvest of Spine Information programs. This fall will be a particularly busy one in Raleigh and across the world. To begin with, October 16th has been designated World Spine Day, in conjunction with the AAOS' extended Bone and Joint Decade Initiative. This year the focus is "Straighten Up and Move" with an emphasis on exercise and spine safety. A website (www.worldspineday.org) has information about global and local activities as well as brochures and information. My office will take the week to feature instuctional handouts and demonstrations in order to better inform all my patients about the need for good posture and good spine function as they grow. 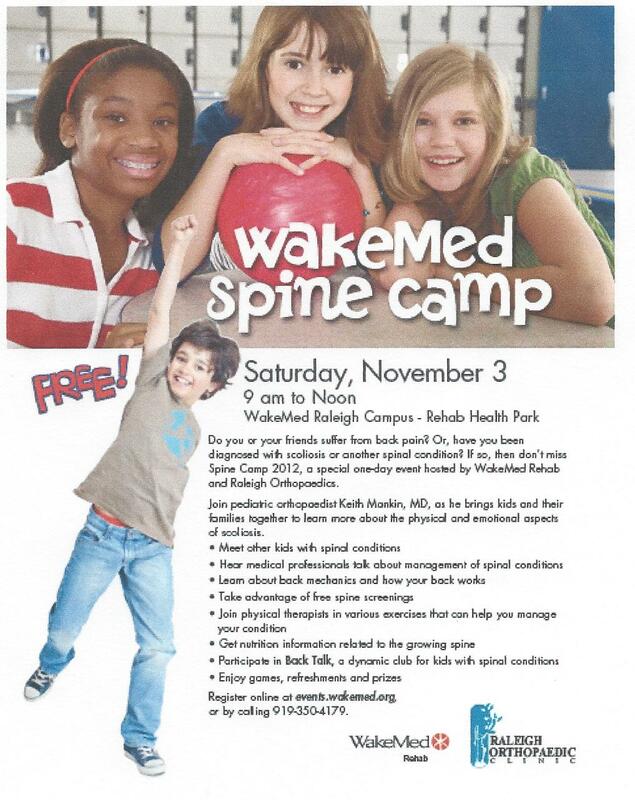 The Pediatric Spine Information Season peaks on Saturday, November 3 with the Fifth Annual WakeMed Spine Camp. 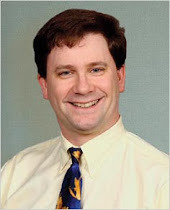 This program, co-hosted by me and WakeMed's rehabilitation department, is a morning of information, events and fun geared towards a better understanding of the spine and spinal conditions that affect kids. Every year we have demonstrations of back and core exercises, discussions of nutrition (with milkshakes! ), art activities and, possibly the most popular part, technical exhibits of spine braces, equipment and instrumentation that allow the children and their parents to get hands on experience with the equipmnt that ultimately may affect their lives. It's hard to be as scared of a spinal rod when you have actually placed one in a sawbones and seen how it works to correct a curvature. This year, in an effort to include a larger segment of the population, we will also feature information and demonstrations on proper back function and backpack safety. The Spine Camp is part of my continued efforts to demystify and destigmatize spinal conditions in the minds of the patients, their families and their friends. The Camp is wholeheartedly supported by Backtalk, who have a table and put on an open session for all attendees. It is our feeling that the more people who understand spine conditions, the better the individual with a scoliosis or kyphosis will be able to deal with her own condition. So I invite anyone in the Raleigh area or any reader of this blog who wants to see how Backtalk and our Spine programs work to attend this wonderful event. 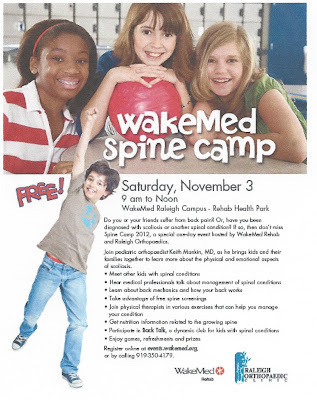 Again, it is Saturday, November 3 from 9 AM to noon at the HealthPark on the WakeMed Raleigh campus. It is FREE and I can guarantee it will be FUN! Oh, and happy World Spine Day!